Taking care of my skin has always been very important to me and something I’m constantly experiencing with. I’ve been pretty lucky my whole life in that I don’t have acne prone skin, but I do deal with combination skin – dry in some places, oily in others. Recently over the past couple of months, I’ve noticed that my skin has been SO dry. Usually during the winter months, my skin will get dry, but this was totally different. My makeup didn’t look good, my skin was flaky and sometimes at night it was actually itchy it was so dry. 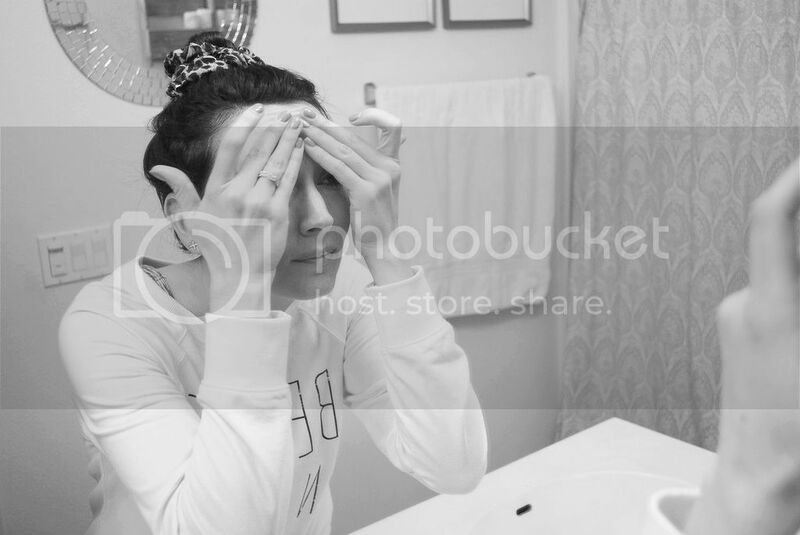 I was trying everything from deep hydrating masks, expensive facials, drinking TONS of water, trying not to wash my face more than once a day….the list goes on. 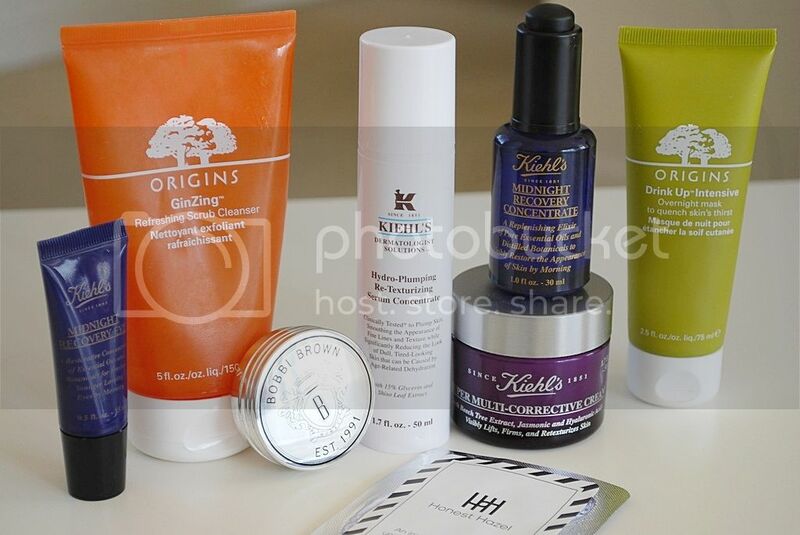 I’ve used many products but I continue to always go back to two of my favorite brands – Kiehl’s and Origins. I’ve had my most healthiest skin when using these products throughout the years so I thought it was about time for a little tune up. I decided about a month ago to go into the Kiehl’s store, sit down with someone and discuss this dry skin problem I was having. My skin was desperate for help. 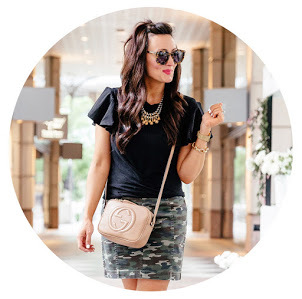 I sat down with a super helpful (and sweet!) employee named Sara who was bound to solve all my problems. She took out this tool that they have called a “Dehydration Analyzer” that is suppose to give you a number that tells you exactly how dehydrated your skin is. The number you want to aim for is around 50. That means your skin is hydrated, doing great and in the clear. 30 – 40 means your skin is slightly dehydrated and under 30 means you have a major moisture problem going on. She placed the pen on my cheek and low and behold my number came back at 27. YIKES. I mean, I knew something was wrong, but this was crazy! We then decided that I needed a major moisturizing regimen change and came up with a list of products to try and see if there was any noticeable difference. I decided the only thing I was going to keep the same was my cleanser. I’ve used many cleansers and I always come back to the same two – “A Perfect World” & “GinZing”, both by Origins. 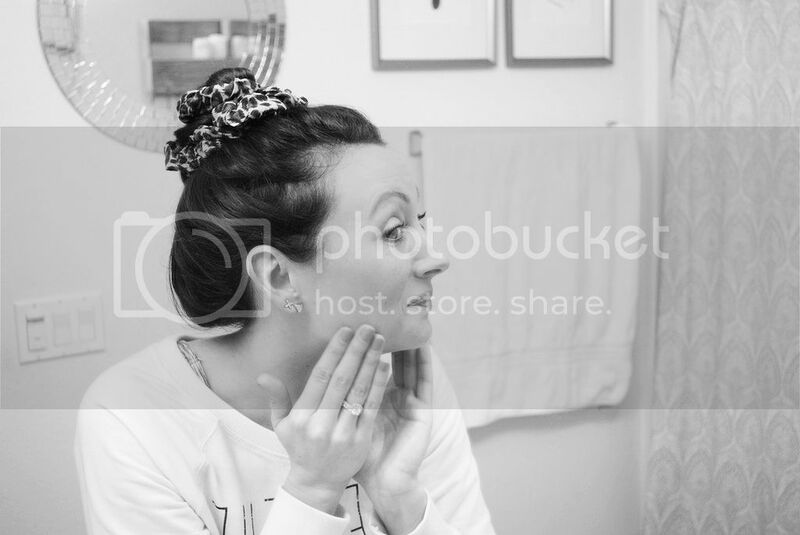 I use the Perfect World cleanser about 5 days a week and the GinZing cleanser the other two days. The GinZing cleanser acts more like an exfoliate which I don’t want to do every night, but doing at least twice a week really helps my skin. It smells incredible (like oranges) and leaves my skin feeling so amazing. A new item I added into my routine which I use right after washing my face is Kiehl’s Hydro-Plumping Re-Texturizing Serum Concentrate. This stuff is great! You only need the smallest amount and it goes a long way. The way my face feels after applying this is smooth and so refreshed. 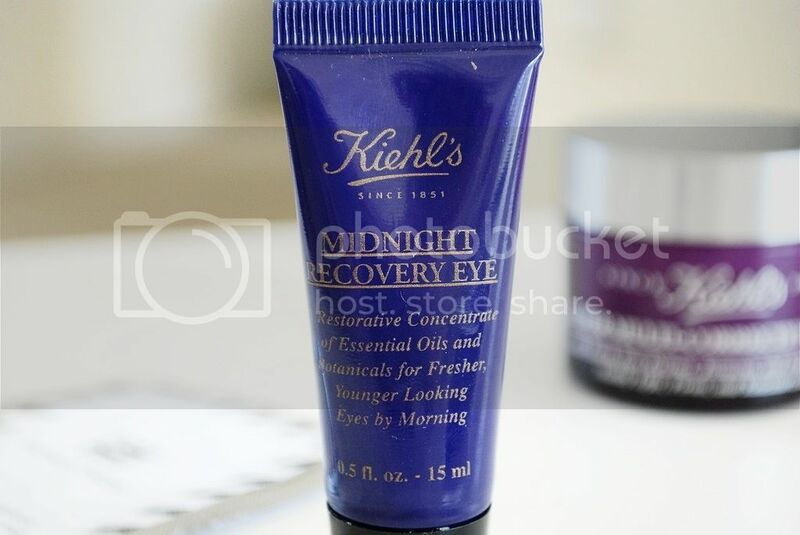 After the oil, I’ll apply Kiehl’s Midnight Recovery Eye Cream under and around my eyes. 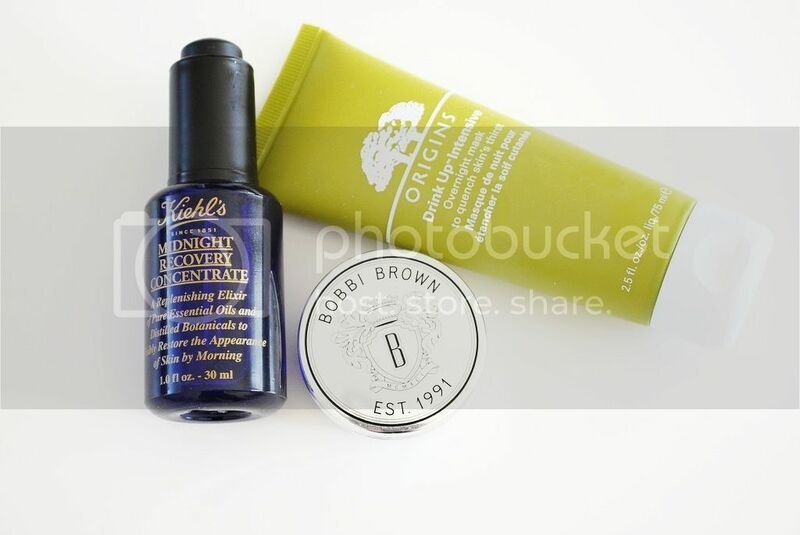 In the past I’ve used Kiehl’s Creamy Under Eye Treatment With Avocado which is also a wonderful hydrating eye cream, but I wanted to switch is up and try something new this time around. So far, I’m loving this one. 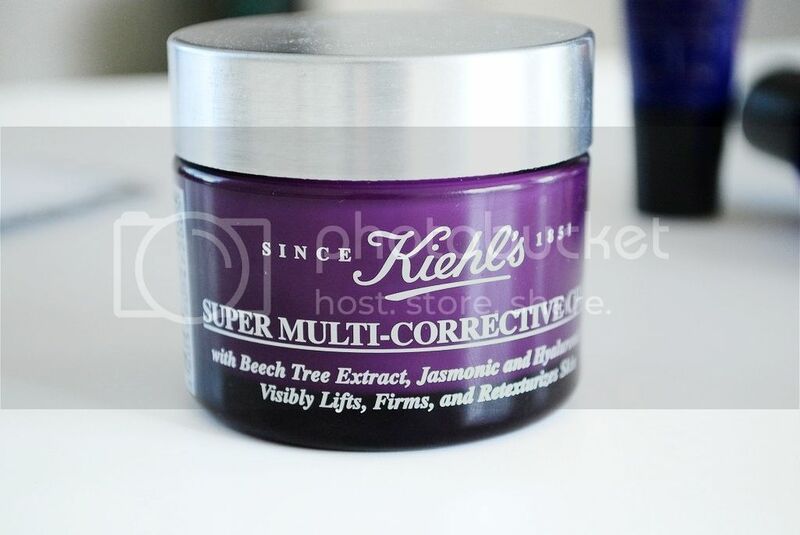 After the eye cream, I’ll apply Kiehl’s Super Multi-Corrective Cream all over my face. This is a very rich facial cream that really hydrates and corrects the skin. The smell is calming and my skin feels so moisturized and relaxed after using this. Last but not least, I end with moisturizing my lips. I use Bobbi Brown Lip Balm and love how soft my lips feel in the morning. It’s not fragrant and doesn’t taste like anything so it’s perfect for night time. I also just love how pretty it is! 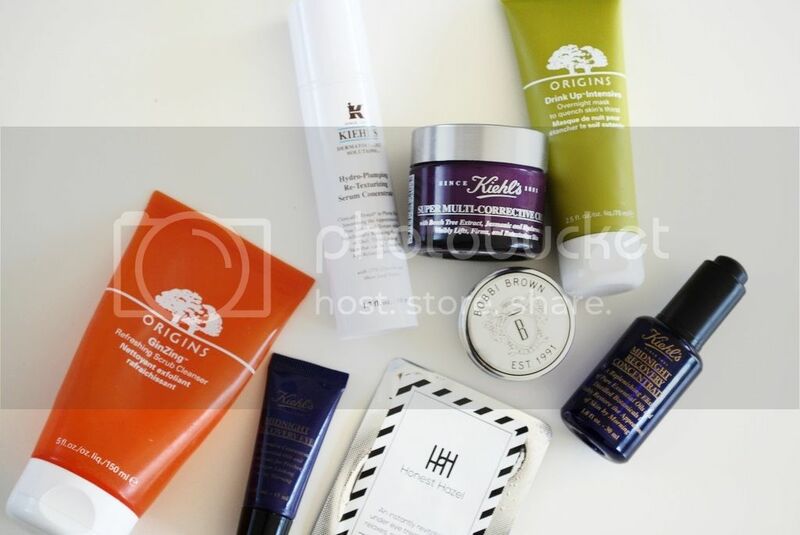 Two other nighttime routine skin care items that I’ve been recently loving and use about 1-2 times a week are Origin’s Drink Up Intensive Mask and Honest Hazel Eye Gels. I use the mask maybe once during the week or when I’m traveling and when my face needs a little extra hydration boost. The Honest Hazel Eye Gels are new to me and I’m so happy with them! I put them in the fridge for about 20 minutes before applying them under my eyes to help with fine lines, pigmentation and dark circles. I can definitely tell a difference when I use these before bed and will probably start using them sometimes during the day for a little refreshed look around my eyes. Also these are great for those emergency days when crying is in the picture and you need to give your eyes a little extra love! 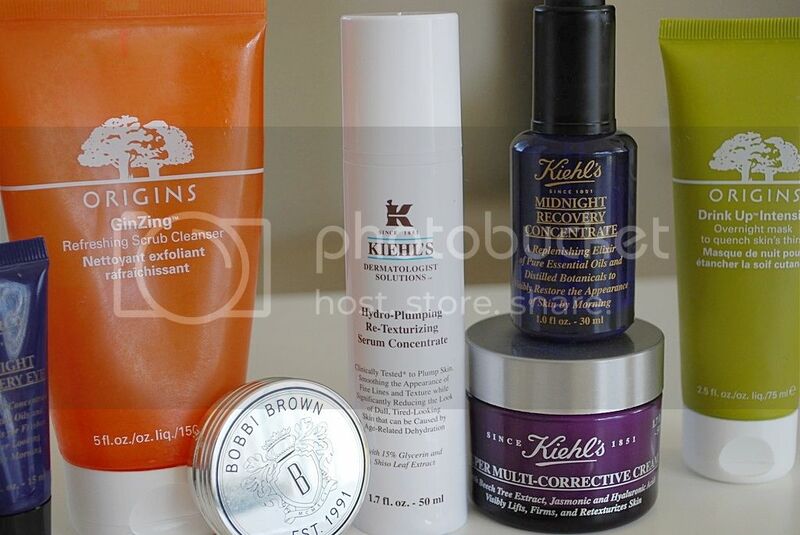 After about a month of this routine, I went back to Kiehl’s to have my skin’s hydration level tested again. I knew going into the store for a second time that my skin was totally different than when I started. I could feel it AND see it. No more flaky skin, my makeup looked smooth on my face and the itchiness was gone. But I also wanted to see how dramatically the number had improved. Low and behold I was at a 42! I knew it jumped up but was shocked at how far in just a short amount of time. Needless to say, I think I will be sticking to this routine for the next couple of months as my face finally looks and feels healthy. I highly recommend going to Kiehl’s and having your skin tested – it’s free and can really help steer you in the right direction to tackle whatever skin problems you are having. I’m so glad I did!